Operated portable in Delaware, Kent County, in or near Woodland Beach. 27-foot elevated ground plane vertical attached to the minivan. "High" power was only 400 watts. Participated in the other three QSO parties too. Operated about six hours Saturday. Thanks to the organizers, and thanks to all the volunteers. Good idea to hold it on the same weekend with those other three QSO parties. First contact was with Milt, N5IA (N7GP) on SSB. He was scouting out his ol' county line, seeing who was operating there. Hopefully he misses the action! Thanks guys for all the work. It's time to apply for a different callsign -- the last thing I heard from several people was "Standby, I'm swinging the beam towards 4-land". A lot of good mobiles out there this year. I decided to do just CW this year after doing just phone last year. How come no one wanted to go to 10 meters??? Thank you for detecting my tiny sigs. Poor conditions but a lot of fun. CUAGN next year! Fun contest. Wish I had more than an attic dipole. Nice turnout of 7's for the contest. Signals varied a great deal, from weak to true S9, but some stations did not even seem to hear a trace of my signal while others, even if weak or mobile, came back on first call. We had a *great* time in 7QP this past weekend! We operated from my "second home" QTH in Goldfield, NV - Esmeralda County. Bruce N7TY and I did a Multi-Single HP effort and feel we did well. LOTS of activity this year. Tnx for all you do to organize this event! This was my first 7QP. Had a great time and did much better than I had expected running QRP. I was surprised how well stations could hear me, especially a JA coming back to my CQ on 40M, Saturday morning. My equipment used was a K1 @ 5 watts to a 3 WL 20 meter long wire antenna @ 45'. When my paddles fell apart I went to my Vibroplex Bug. I operated for about 12 hours and it turned out to be a very busy day. Busy weekend with 7QP, NEQP, DQP, and INQP. Confused the heck out of me trying to keep it all straight with paper logs! But, lots of fun. Missed only Wyoming. Where was WC7S? Thanks for hosting the 7QP QSO Party. Only two contacts but two all-time new counties for me. Wow, loads of activity this year - W.A.S. in 18 hours - great fun! difference between copy and no copy! My first 7QP. 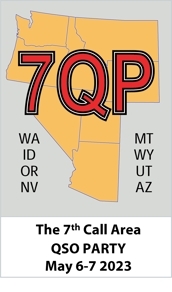 From Indiana I still need many counties for my US County Award, so the plan was to take part in 7QP (I thought I'd make around 100 QSOs) plus the Indiana QP and if time permitted also work the NE & DE QP's. 7QP began first at 1300Z and I kept busy hunting mobiles on 20/15m CW and trying to run on on 15m. The condx were great on 15m, but sometimes very weak signals from mobiles or BIG QRM from EU contesting stations on ARI Contest on 20m. The condx to the 7th area were great - so I changed my plan: no time for those other QP's! - Excellent condx on 15m, several times I tried running on SSB and made 51 SSB QSO,last QSO with KT7G/M at 21:50Z! - At my sunrise I checked 80m several times and heard Jerry K5YAA, but unfortunately I could not break the pileup. and gave me many points and multipliers! MY BIG Thanks for mobiles who gave me so MANY QSO's/multipliers/rare counties!